You hear about Google and you hear about all these modern high tech buzzy companies — they get chefs in the canteen and are buzzing around on their powered skateboards around things and sliding down slides, and they’ve got all this company culture. They sit around on bean bags and things like these. Gary Vaynerchuck’s Vayner Media, Aweber, all these companies. And you think how on earth does that apply to me? Well I can help you. We’ve got it, and we sell fire extinguishers and safety signs, and smoke alarms and access panels. What are they? Who knows? Someone wants them and we sell good ones. So company culture can be done. So the first step in building a company culture is actually knowing your why. There is a book by Simon Sinek called ‘Start with the Why’. And in my 5 questions, we start with the why. It is, most businesses do because unless you have a reason for being in business, then it’s just a job. So why did you start your business? Think about it. Write it down. This is not a 5 second exercise. Write it down. Now you might be bored, you might be struggling but when you started, or when you joined, why did you do it, why didn’t you get a job? Was it just because you’re self-employed, in which case that’s different. That’s fine. but when you started your business, when you started selling left-handed hammers to, or something like that, did you figure out there was a need? Was there a reason, did you, could you not find a left handed hammer for yourself? Was that the reason? Did people keep saying, ‘Oh I can never buy a left-handed hammer?’ Was there a reason? Yes. Back in the day, you had a reason for it. There was a need. Get back to that mindset. Can you remember when you were excitedly lying in bed, thinking of all the left-handed hammers that you are going to sell because all those people around the world that need them. Get back to that. Find the why. Now once you’ve got that, then we need to work on communicate. Alright. You need to, second step, communicate constantly. Not just a bit. Now the main communication is with your staff, or your team. So when I say communicate, I mean one to one meetings that don’t have to be meetings like you’re thinking of horrible meetings. They can be chat, but they are formal. 15 minutes should do it. Have a little 15 minute agenda. Stick to it, don’t chat and waffle. Do that in non-meeting chats and waffle, and rambling sessions. Okay, waffle in the UK by the way we don’t eat waffles. We waffle, which means rambling on. Which is what I do on these podcasts. Sorry. So communicate constantly. Once you can communicate with your team, and you can convey the why. The reason you started the business and get them on board. This isn’t a one step process. Gradually get them onto, they realize and they buy in. that’s the term you are looking for is buy in. Once they have bought in, then they start to enjoy their job. Yes. And then the next ones to work on are, is communicating with your potential customers. Don’t try and sell them your product. Try and get them to buy in to the same why. If they can buy in, they have a different reason for buying and its emotion. And that is much more rewarding and is going to last you longer. Trust me. 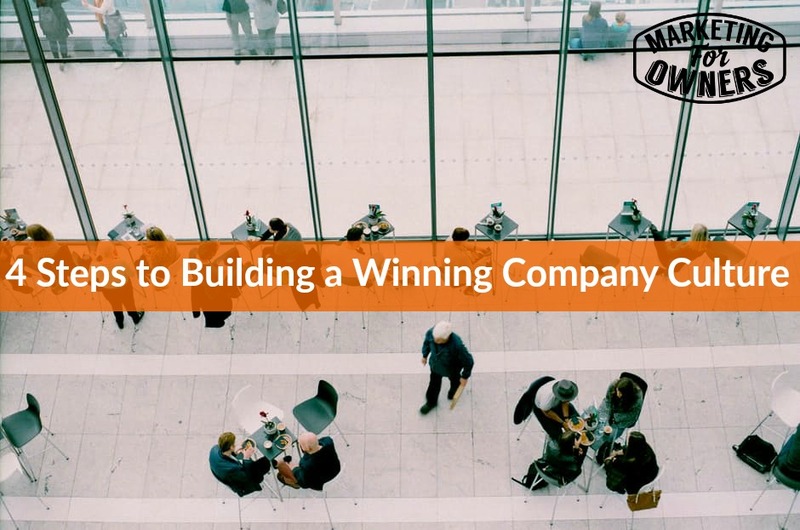 Now going back to, Step 3 in building a winning company culture. If you want a proper team that’s going to work then don’t employee a mini me. That is step 3. So quick summary. Step 1, Know your why. Step 2, Communicate constantly. Step 3, 3 fingers, don’t employee a mini me. Now very simply, if you employee people like you, you think you are wonderful, don’t you? You are wonderful, beautiful, oh gosh, are you good looking or what. But you wouldn’t want to work with you, would you? How would you clash? How would you complement each other? In fact funnily enough, I was going to actually say, employee people who complement you, but some of you may have misunderstood that as getting people saying, ‘Oh I like your hair today sir.’ But I mean the opposites attract. If you go to www.howtofascinate.com and look for Sally hogshead’s test, do her free test, use the code MFO. MFO for marketing for owners. Will get you a freebie. Go in there, do a personality test, do it on your employees. And then see how, who would complement each other. Who will work best with each other? Don’t go firing anyone. But just, in certain projects some people will work better with others. This will enable a company culture. You cannot try and have perfect people. The world is full of imperfect people. As one here, talking to you right here now. You cannot sculpture people. Just let them be. They are great. People have babies, and they can bring them up and they become adults. It’s fabulous. That’s quite clever. So if they can do that, they can do your work. Just let them do it. So fill it with all sorts. Fill it with complementary people. Do not have them just like you. That’s the other thing. With your staff, don’t act like a boss. Act like a colleague. They are just like you. They are probably better than you. If only you give them the chance. If only you’d let them. Don’t tell them how to do things other than at the start. Let them go, let them make mistakes. When they’ve got those kids at home, when they learned to drive, when they went out and walked on the ice, and slipped over. They figured it out. They didn’t slip over the next time. They figured it out. Allow them to do that in your business. Allow them to use their initiative. Don’t put them in little boxes. When you delegate, don’t put boundaries. Encourage them to do this. Reward them. Otherwise, people will be suspicious, and they’ll be scared to fail in case something happens. Reward people who fail but gave it a go. This is how you build a company culture. You do not punish people. You do not berate them for failure. You do not point out everything that they did wrong. Or how they could have done it better. You allow them to learn and you show them the rewards of what using initiative and what putting that effort in will get them. That is how you build a company culture. And once you’ve got a company culture, you’ll have no staff problems. You might have some but you’ll find it ridiculously different. And you’ll have people who actually want to come to work. Amazing eh? Anyway, enough for that. It is a Monday, we always have a book for a week. And we are going back through the good ones. This is one of the best. I recommend this very highly. 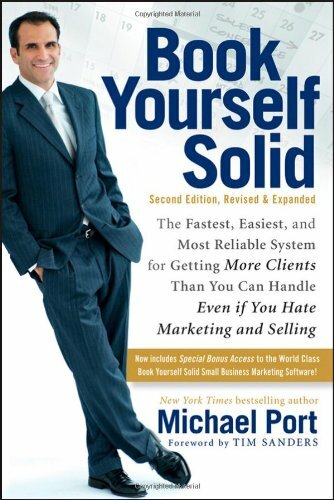 By Michael Port it is called ‘Book Yourself Solid’. The book has been around for a while. Michael Port is a genius. He’s got a fantastic podcast as well, and he is a brilliant, one of the best speakers, but Book Yourself Solid is an entire business from beginning to end. It’s just an entire how to. If you are a consultant, something like that, you work for yourself and you get clients, get that book, read it, do everything he says. It’s wonderful. I will see you tomorrow.